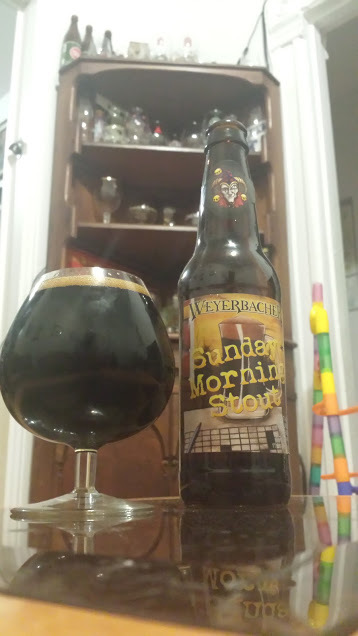 Though I may not quite have been in shape as rough as that forewarned by Kris Kristofferson following Benelux Verdun's 2nd Anniversary party, I did feel a special need to commemorate this Sunday as the cooling temperatures - and fading coffee - encouraged an imperial stout afternoon/evening. Having procured a bottle of Weyerbacher's Sunday Morning Stout, as well as recent bottles of Founders Breakfast Stout and KBS, I figured I had to do these together. 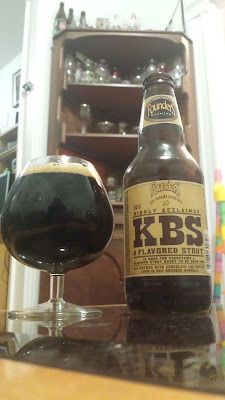 Some people have been calling Sunday Morning Stout "the KBS Killer," and memories fade while imbibing together produces a fairer (if still biased assessment). 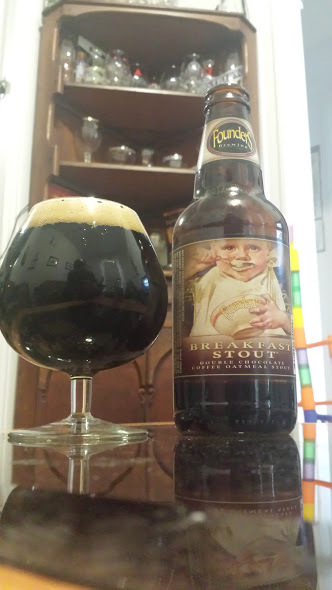 Just what makes a stout a breakfast stout, you may ask? Well, the coffee that is in each beer. Founders Breakfast Stout also has chocolate (alongside flaked oats), while KBS (Kentucky Breakfast Stout) - though a different base beer - maintains the coffee and chocolate but adds aging in bourbon barrels. 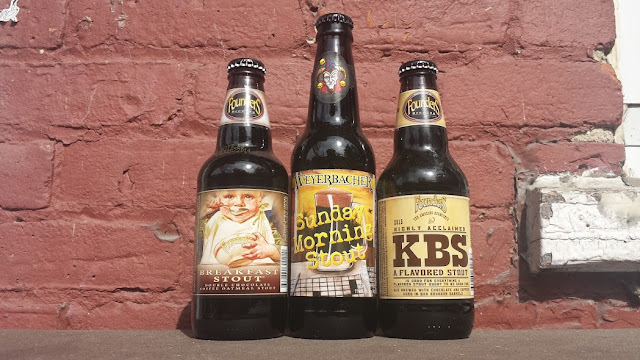 Sunday Morning Stout follows the same pattern as KBS: coffee and bourbon barrels. Though none of these beers are available in Canada (outside of trading circles), they are available in most North-Eastern States and are worth your quest, especially if you like BA Stouts and coffee. And really, who doesn't? For comparison, I will grade all as per BJCP ratings on the table below. At 8.3% ABV and 60 IBUs, Breakfast Stout should be a bit drier than it is, but it is still a treat. It pours a deep, dark brown body capped by a moderate mocha head of pretty fair retention. The head lingers slightly for quite some time, sitting in spotty rings around the top of the beer with some thick, almost milkshake-like lacing around the edges. It wafts a more coffee forward nose than chocolate, but smells almost like a cold coffee with added chocolate flakes. The taste begins with lightly sweetened coffee notes, before switching first to what seems almost milk chocolatey with a hint of bittering hops (though only dark chocolate is used in the production) before finishing with tastes of semi-sweetened dark chocolate (and a final trace of coffee). The body is moderately full, and yet not as thick as one would think for oats, chocolate, and ABV, and it remains super-drinkable with a creamy and velvety, lightly carbonated feel coupled with just a touch of warmth in the end. KBS comes in at 11.2% ABV and 70 IBUs, for a less bitter BU:GU ratio than the Breakfast Stout. Likewise, the head is a touch lighter in colour (between tan and mocha) and also dissipates faster, though this is not unexpected for its high ABV. It seems a tad darker in colour, but it is not much different. Though I have often said this smells like a vanilla bourbon bomb through and through, there is a hint of chocolate there too though none of the coffee which has been muted by the bourbon notes. It smells pretty much like a marble ice cream cake would smell - if it was 85% vanilla and 15% chocolate. The taste is a bit sweeter up front, with a more mocha or cappucino-esque sweet choco-coffee thing up front that evolves into the bourbon forward vanilla and semi-sweet chocolate finish with a fair linger. The feel is very similar to Breakfast Stout in its velvety smoothness, but the body is oddly a touch lighter (not light per se). This makes it remarkably drinkable for its high alcohol content, but also brings with it a touch of bourbon-like heat as it warms the chest on the way down. The ethanol notes are quite muted by the dessert-like qualities of the beer, but you can't mute that feeling by adding adjuncts and aging in oak (so it isn't a knock against this marvellous treat). Sunday Morning Stout is perhaps the boldest of the bunch, but more on that in a moment! It comes in at 11.3% ABV, with unknown IBUs. It is visually the thickest and darkest of the bunch, with the darkest mocha head, but also the slightest and the fastest receding, leaving only the faintest of rings around the top of the body. Lacing is scant to non-existent. The aroma presents as intensely coffee forward. There is faint wood and just the slightest trace of vanilla bourbon notes, but nothing like the KBS: one is a vanilla bomb, this a coffee-bomb. The taste is much like it smells with a bit more complexity. Coffee is still predominant, but in the finish, just before the linger, one gets drier roasty and slightly hoppy unsweetened dark chocolate notes before some bourbon vanilla and caramel, yet the start and the linger are dominated by espresso - in a delightful way. The body is more full than on the Founders beers, while there is also a touch more carbonation. Yet the feel isn't as smooth with more of a syrupy, sticky quality. The warmth is a touch more present on the back of the palate, as is the glow in the cockles. KBS hides the ABV a bit more. Though this gains marks for the body, it loses in feel for the remainder. Still, a super treat! If you consider that I tasted somewhere in the vicinity of 80 beers at last year's Mondial de la Biere, and gave out merely two ratings over a 45, the ratings above attest to the stellar quality of each of these brews. However, in many ways the comparison is poor. Sunday Morning Stout would better contrast with Dieu du Ciel's Péché Mortel (or Péché Mortel Bourbon) or perhaps Avery's Tweak, while even BS and KBS are two different beasts, even if similar. They are not comparing apples to apples, but if I had to pick, I'd gladly drink any of the above, any time. 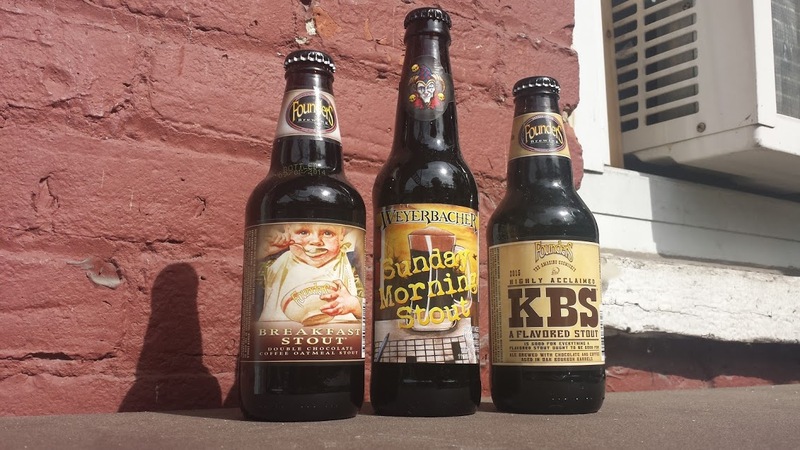 Personally, it depends: you want chocolate, go BS, you want vanilla, KBS, you want coffee, that's where the Weyerbacher excels. What a night... what a treat!